The July 13 mini-summit session will feature the “idea marketplace,” during which each of the 15 strategic initiative working groups will put on display the project ideas they have proposed for the strategic plan. Faculty, staff, students, alumni and community partners can learn about and provide feedback on potential projects at the next strategic planning mini-summit on July 13. The session will feature the “idea marketplace,” during which each of the 15 strategic initiative working groups will put on display the project ideas they have proposed for the strategic plan. During the open house-style event, participants can visit each working group’s display and learn more about each project, which could have high impact on Wright State. Participants can also vote for their favorite projects. The working groups will evaluate the feedback they receive as they consider which ideas they think should be addressed through the strategic plan. Those who cannot attend the session can provide feedback on the proposed projects on the strategic planning website. RSVP through the strategic planning website. Sessions will be held from 8:30 a.m. to noon in the first-floor gallery space at 2455 Presidential Drive. You do not need to attend every session to participate in the process. Supervisors and managers are encouraged to provide employees with the time to attend mini-summit sessions as business conditions allow. Participants are encouraged to wear green and gold on the dates of mini-summits to show their Wright State spirit. 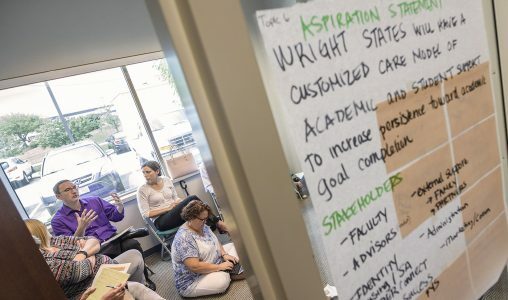 Participants have formed working groups for each of the 15 strategic initiatives organized around the themes of collaborative delivery of services; research, innovation and entrepreneurship; strategic relationships and partnerships; teaching, learning and programming; and the Wright State experience. The mini-summits provide space for the working groups to propose, evaluate and prioritize projects for the strategic plan and identify the milestones, resources and metrics to include in the strategic plan. During the third mini-summit, on June 22, participants were challenged to think radically as they work on the strategic plan. Fecher said the board is not looking for a strategic plan for today’s world of higher education, but rather one that invents a university of tomorrow because the environment of higher education has changed so markedly. “Let’s really push the boundaries to get a plan that is different than anybody would see at another university,” he said. Read more about the June 22 mini-summit.